Dear Tony: What is the one thing you ask beginners to master before they move on? - T. Simon; Topeka, Kan. 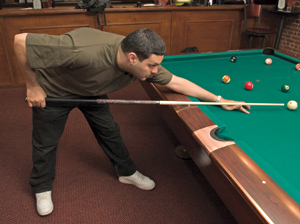 The stance should be about 45 degrees to the line of the cue. Their fundamentals - their stance, grip, stroke, rhythm and making sure to stay down on the shot after their follow-through. If it's someone who has hit the balls a few times and has a little stroke going, the most difficult thing for them is usually keeping the arm in a dead-straight line. Total beginners struggle the most with stance. You try to get them to stand a certain way, and they just can't force their body to do it, so you have to constantly remind them where they have to place their feet and how far apart and how much you bend the knees. You could have the most incredible stroke in the world, but it doesn't mean anything if your stance is incorrect and not lined up with the shot. I always tell them to make sure that their right foot is underneath the cue stick, and that the left foot is roughly at a 45-degree angle from the line of aim, which is the cue stick. It can be a little more or less than 45 degrees, depending on body type. Mine is about a 40-degree angle. Dear Tony: When I start missing shots, I develop a really bad attitude about my game and it just makes it worse. How do I stay positive? - Teri P.; Evansville, Ind. In practice, the best thing to do is say to yourself, "I'm having a bad day. Let me take a five to 10 minute break and think about what's going on." Then set up the first shot that you missed and shoot it over and over until you get into a comfort zone - until you can say that you've mastered the shot. Then move on to other shots that you missed. In a match, it's a different story. The one thing that I've always taught myself is that the first thing you have to ask yourself is, "How bad do I want to win?" If the answer is that you want it really bad, you have to be willing to go through whatever it takes in order to get that win. You have to be able to completely erase what has happened to that point and focus only on the present. After the match, you can jot down the shots that you missed so you can practice them later on.